The world's first deluxe whey protein energy bar! 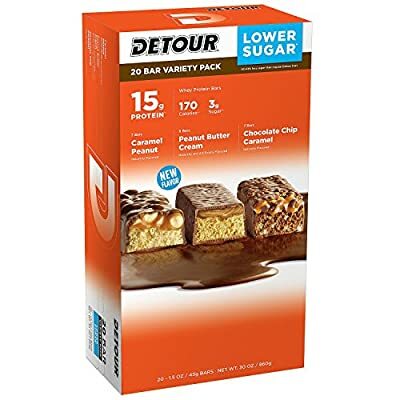 What's the buzz surrounding DETOUR It doesn't look like a regular protein bar, and it certainly doesn't taste like a regular protein bar. Caramel, crunchy roasted peanuts covered in rich chocolate to deliver a nutritional profile unmatched in protein bar history. Each triple layer DETOUR bar provides loads of muscle building protein powered by Americas #1 selling protein Designer Whey. Combined with the breakthrough GlycerLEAN, helping your hard working muscles recover and get leaner, stronger, faster after workouts. Energize your muscle gains while satisfying your taste buds. A full 30g of protein per bar!